A cake reminds me of my sis, EVERY TIME! Its not that i do no eat it anytime, but i usually prefer spicy over sweet! I respect people who love to gobble up cakes, but i do not understand how anyone would love to eat a chocolate cake! I will NEVER eat that! I always get the ' OMG, you do not eat a chocolate cake??' kinda look every time i say no to a choc cake piece, but i just smile and say no. Its very difficult to explain people who love certain things about our non-liking towards it! So i do not even try. And it always ends up with the 'God knows how you cannot like this' look and in my mind i say ' God knows how u CAN like it'! Once i was browsing over some sweet dish recipes and the recipe for choc cake popped up. I HAD to open the page, no prize for guessing, my sis was sitting next to me. Reluctantly, i went through it and without a second thought closed it and went over to another page. And i heard my sis yell. I was like 'What?!?'. 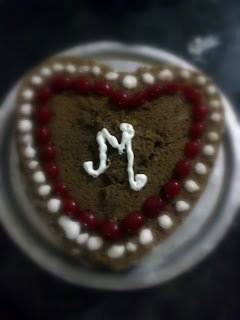 She said ' Didi, Please bake a cake.. For me'! Now the latter part of the line melted me. You can imagine her with that ' You are not gonna say no to me right?' face. I HAD to give in. It was my sister. The next day before leaving to school, she reminded me again and in my sleep i said ' Yeah Yeah'! :p I woke up later and was planning about the activities of the day, not even giving the slightest importance to the cake! I logged in to the internet and to my surprise i see my sis's status message on her IM window which read ' Yaaaay, today my didi's gonna make a choc cake for meeeeeeeeee'! I was like ' Oh so sweet'! and then immediately i said ' Damn'! I am her didi and i am the one who has to bake it! Baking a cake? And Me? ME?? God knows how, I wondered. The next half an hour was spent in going through ' Easy Choc cake recipes'! :p And i finally found a good one. A normal choc cake recipe. Now i dint know what was easy and what was not! Forget baking, i had not EATEN one!! But then i HAD to do this. So i gathered the ingredients, some confidence, little interest and started! OMG! 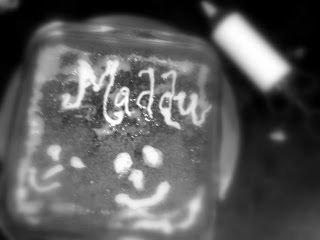 I was baking a cake! Hard to believe! All these compliments made me realise that nothing is difficult. If we have the will we can accomplish anything but of course with God's help. After a week one of my friend called me up and told me he was leaving to Bangalore that night. I said Okay kool and thought to myself ' Why not bake a cake and give it to him so that my friends can taste it there in Bangalore?' I told him about the 'Parcel' that he needs to take with him, not telling him what exactly i was giving him. I baked a cake and packed it well and wrote notes for my friends on the parcel and sent it. Meanwhile i sent a message to my friend to collect the parcel Asap! I was a little worried coz my friend couldn't collect it on time and i thought it must have gone bad. I got a text in the evening saying the parcel was collected, but i wasnt happy coz i was very sure that it would have definitely gone bad by that time. So i replied back and told them that its not gonna be good, with a sad face. I was feeling bad coz i had made it with so much of love and care, but it would not be serving the purpose coz they would not be able to eat it! And then i got the following texts. "If bad tastes so yummy, i wonder how would it taste when its fresh!! Its Awesome!!" "Hey Naaz, the cake is awesome. Even next time when i come down , prepare this and give us"